A cracking performance by the “KP Nuts and Big Nuts” team won first prize in this year’s annual Christmas Scramble. 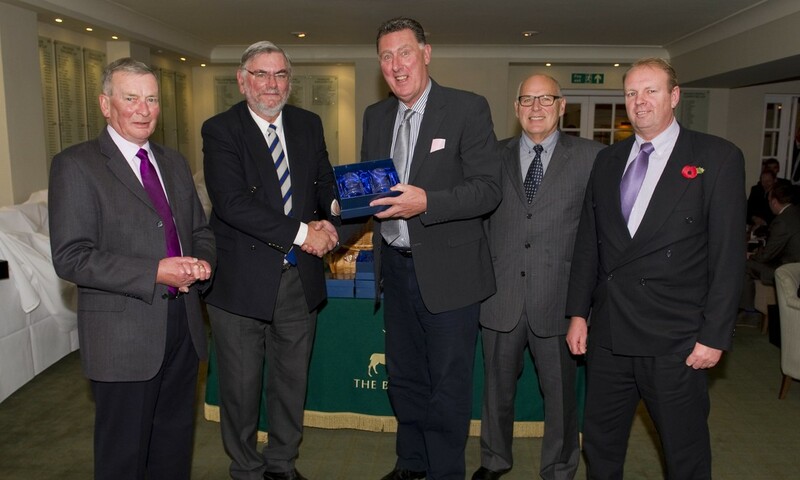 Team Captain Keith Burkin was unable to stay for the prize-giving but in a call from Harmsworth Printing to the Berkshire Golf Club where he had earlier lead his team to such a nutcracking performance, he admitted that he was shell-shocked to hear the news about their win. Close up in second were the Mail Newspaper’s “Tee-mendous Team” of Nick Stevens, Danny Williams, Chris Leake, Laurie Brannan and Janet Lee who were not quite tee-mendous enough to win, but whose score of 60.5 was just .7 behind the winners. Although a team of five players they were suitably handicapped to take account of the extra player. They were just .2 in front of Mike Wall’s “Oddjobs” team of Stephen Riley, Phil Lightbody and John Frith, who had just enough “evenbase” out on the course to win on count back from the Mail Newspapers “Ad-Fabs” team of Graeme Rossiter, Nigel d-Cruze, Nigel Bromley, Captained by Brad Young, who advertised their golfing ability in fourth place. It was great to see Bob Cass back in action, not only swinging a golf club but joining Society Chairman Vyvyan Harmsworth in a double act for the fund raising auction. Bob’s “The Eagles have Landed” team of Clive Heard, Chester Stern, Ian McIlgorm and new Society Captain Graeme Thomson, won a nice Christmas nest egg of a prize when they managed just enough flight to land in 5th place with Ian McGowan, Brian Lamb, Mike Creaby and John Bowman being literally “Tee’d off in Berkshire” for only managing sixth place. In seventh and proving to be “Mail to a Tee” were Neil Darbyshire, Arthur Martin, Mike Bayley and Christian Gysin and the team that enjoyed the real Christmas stuffing were “The Shooting Stars” of Guy Zitter, “MAC”, Peter McKay and kick-arse trick-shot specialist Geoff Levy who all failed to light up the sky. Trophies for the Match Play Knock-Out competition were presented by Captain Graeme Thomson to winner Mike Wall and runner-up Garth Burden. As a semi-finalist, Graeme received his medal from Vyvyan Harmsworth. Graeme also presented the Order of Merit trophy to Nick Stevens who beat Harmsworth Printing’s Peter Murphy with Mike Wall and Garth Burden in third and fourth places in the end of year play-off.